Company of Animals Multi-Clicker for Dogs is a fun, reward based method of dog training that you can both enjoy. However, some clickers emit a loud, harsh 'click' sound which can frighten your pet. 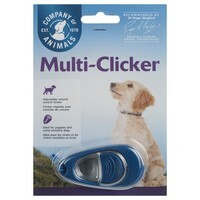 The Multi Clicker has a volume and tone control so you can adjust the clicker to your dog's sound sensitivity. You and your dog can now enjoy one of the most popular methods of dog training and the free step by step guide shows you how to start. Well made and does the job. The variable volume is worth it over more basic ones as the "full-volume" setting is quite loud - fine when outside but startles my greyhound in quieter locations, being able to tone it down when inside really helped get him used to it.